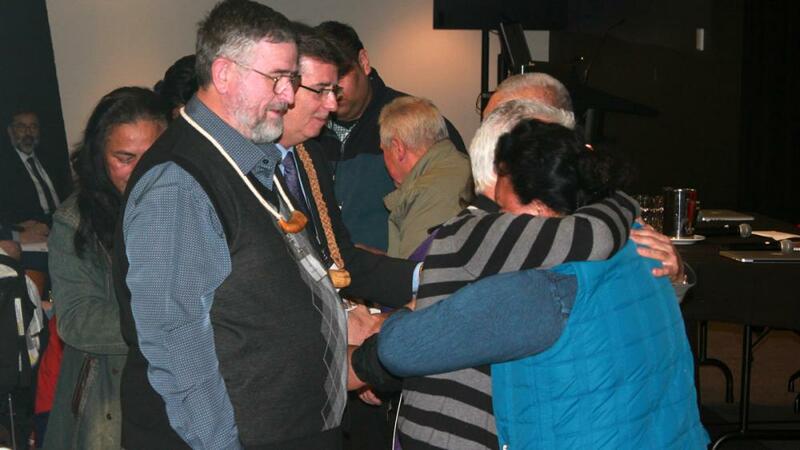 AUSTRALIA – The South New South Wales (SNSW) Conference session on Sunday (September 17) began in an unusual way—with a reconciliation ceremony and a public apology from a church to its ministers. Griffith church publicly repented and apologized for the way they had treated their pastors in the past, extending their apology to the Conference and their fellow churches. 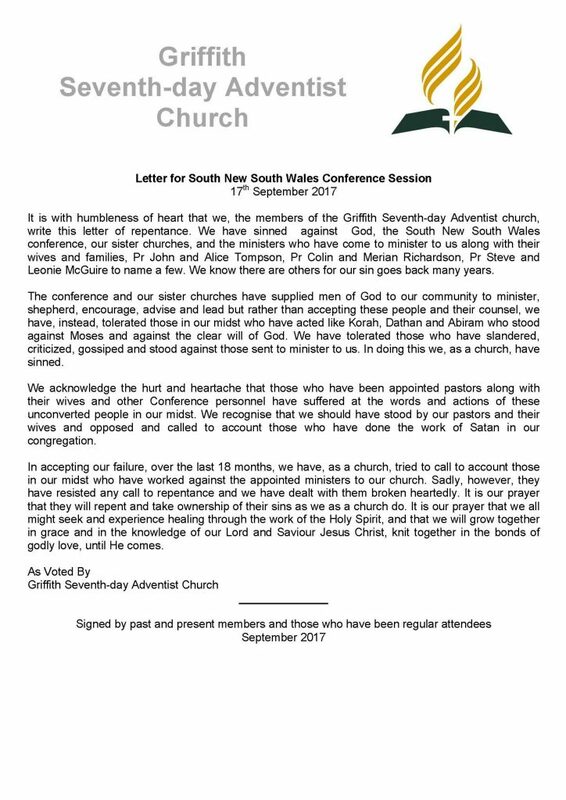 “We have sinned against God, the South New South Wales Conference, our sister churches, and the ministers who have come to minister to us along with their wives and families,” said a statement, signed by the church members. The letter drew comparisons with Korah, Dathan and Abiram and their rebellious criticism of Moses as well as being based on Daniel’s prayer of repentance. The process has been a long one to bring the church to this point. Pastor Jim Tonkin, current Griffith church pastor, said that for the past 18 months the church has been working on trying to change its culture “from one that is performance based to a relationship with Jesus Christ”. According to Pastor Tonkin, some of the members had acted with a critical and confrontational attitude, which caused some pastors to leave the ministry and some members to leave the church. The church members who were not involved in this behavior acknowledged that they stood by and let it happen. “The church has tried to deal with the main people who have caused the problem but some have resisted and have been disfellowshipped while others have taken ownership of the actions and are working with the church,” Pastor Tonkin said. As well as the presentation of the open letter, the church drew on the cultural heritage of its members as part of the reconciliation ceremony. 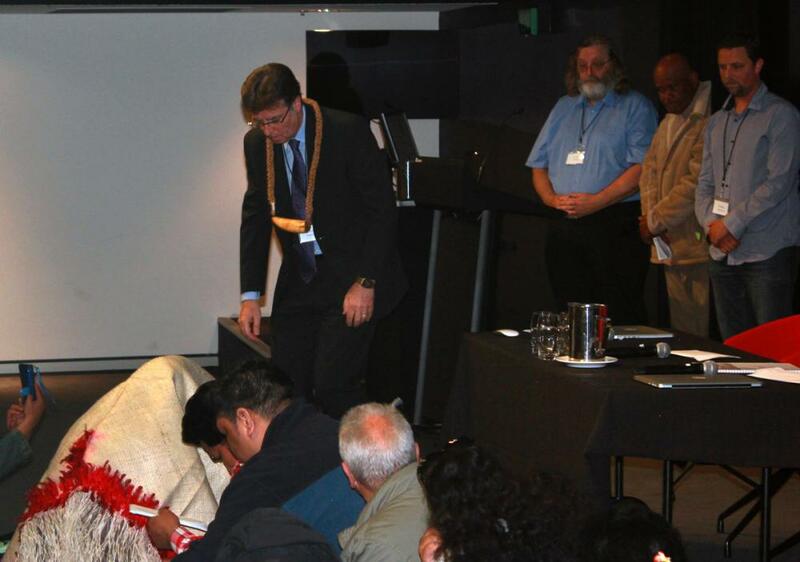 With a large Pacific Island community in Griffith, the different groups all drew upon their traditions: the Fijians presented a number oftabua(whale tooth), the Samoans covered themselves in mats until their apology was accepted and the Cook Islanders proclaimed they were “sorry” from the front of the service. It has been a challenging journey for the Griffith church but they are feeling optimistic about the future. “We plan to move forward and are planning a revival program in the church starting in October to reconsecrate ourselves to God, and that the church becomes a place of hope and a safe place for people to worship and to learn the love of God and be able to build a vibrant relationship with Christ,” Pastor Tonkin said. The church is hoping to engage in planting churches in some of the towns around Griffith and now has a solid base from which to achieve this. “I’d say there are churches and others who should consider taking ownership of their history and bring it before God,” Pastor Tonkin said. Click here for a full report of the SNSW Conference session. This story originally appeared in the Adventist Record magazine.